The president of America’s largest pro-life youth organization says her visit to the White House the day before the March for Life is a sign that the movement to save women and babies from the devastation of abortion is finally optimistic and full of hope. Pence was the first sitting Vice President to address the March for Life, held each year in January on the anniversary of the Supreme Court’s decision in Roe v. Wade. President Donald Trump’s counselor Kellyanne Conway also addressed the pro-life activists on the National Mall in Washington, D.C. on Friday, and the president himself tweeted out his support for the marchers, more signs the Trump administration is giving the movement a thumbs-up. “We have so much work to do as a movement that seeks to make abortion unthinkable and help women facing unplanned pregnancies, but I am hopeful we will make huge strides in the next several years with President Trump, Vice President Pence and his team of dedicated pro-lifers,” Hawkins says. Hawkins’ visit to the White House represents a stark change since the inauguration a little over a week ago. Planned Parenthood supporter President Barack Obama – the first sitting president to speak at the abortion business’ annual fundraiser gala – and his staff greeted Planned Parenthood president Cecile Richards frequently during his two administrations. “What a difference one election makes, now to have an administration that is open to life, that’s excited about promoting life,” Hawkins observes. Hawkins and students from her organization crashed the so-called “Women’s” March on Washington the day after the inauguration following their rejection as partners of the march by its organizers because of their pro-life views. Despite her optimism, Hawkins says the pro-life movement will remain vigilant in holding the Trump administration and Congress accountable. Other pro-life leaders echo Hawkins’ sentiments. 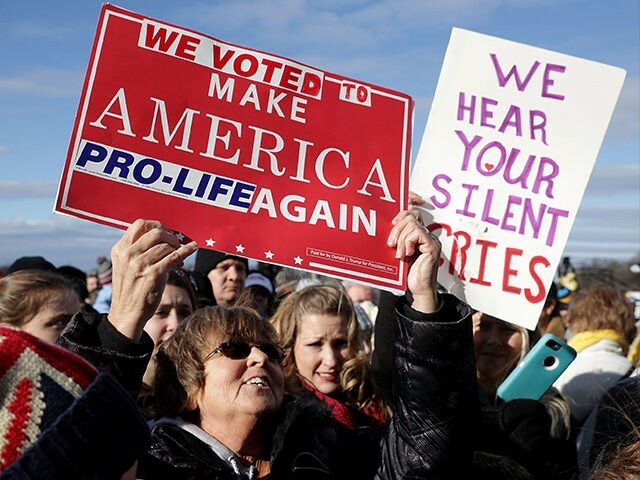 Ashley McGuire, senior fellow with The Catholic Association, agrees that while the March for Life is generally uplifting and joyful, this year pro-life activists are feeling more hopeful and looking to see the promises that were made to them are kept. “The number one priority for the pro-life movement is to have a constitutionalist jurist appointed to the Supreme Court, someone who will read the text of the Constitution and continue Justice Scalia’s legacy, and not just legislate from the bench,” McGuire tells Breitbart News, adding that things are already moving in a positive direction. McGuire also notes the change in mood among pro-life activists since Trump sent both Pence and Conway to their most significant event. “Planned Parenthood has a real reason to be worried, because public opinion is against them and the dominoes are starting to fall in a way that bodes hopeful for actual women’s health care,” McGuire adds.